These laser safety glasses are very high quality. They protect for all the lasers we sell including the 630-660nm red lasers and the 808nm infrared lasers. It is important to note that when buying protective eyewear for laser use, the glasses or goggles you buy must be made specifically for the wavelength you're using. 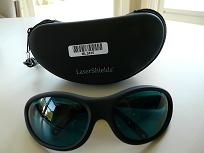 Sun glasses and/or welding glasses, no matter how dark the lens, will NOT work to protect your eyes when using lasers. Also beware when you see a great bargain for laser safety glasses. Some websites advertise laser safety glasses for as little as ten dollars. But do they work? More often than not they do not work and are simply tinted glass. Why take a chance? When you buy our safety glasses you know you're getting quality protective protective eyewear that works.